This chart is from a recent Public Religion Research Institute Poll -- done between March 14th and 25th of a random national sample pot 2,020 adults (including 364 white evangelicals). The margin of error for the entire poll is 2.6 points. 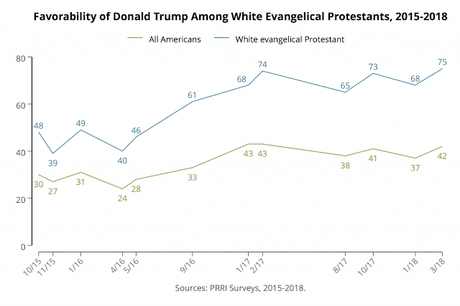 No margin of error was given for just white evangelicals. We now know that Donald Trump is a consummate liar (having lied over 2,400 times since being sworn in), is a serial adulterer, a misogynist who sexually assaults women, a racist who has further divided the country, a man who doesn't pay his bills and cons consumers through fraudulent businesses, an official who has funneled millions of taxpayer dollars into his own businesses, a person who rewards the rich and corporations while hurting the poor and disadvantaged, and has shown he is not averse to breaking promises and agreements he has made. In short, Donald Trump is the most corrupt and immoral president in modern American history. That's why I was amazed that white evangelicals supported him in such large numbers in the last election. None of these things come as a surprise, and anyone could know that by looking at his past history. This is the group that claims to have "family values", and want people to believe their values are superior to those of other Americans. But they ignored those values by giving Trump the support of about 68% of their members in the 2016 election. And since then, that support has not declined -- but has grown to a record 75%.These people have abandoned their religious beliefs and values to support an immoral politician that promised to support their bigoted social agenda. I don't ever want to hear the word "values" from a white evangelical again. They have no values.